Thank you to Janet, Graham's partner, and Graham�s family, Joyce, Dale and Mark for allowing me to create this website at such a sensitive time. Thanks to John Backland (Artist), Groundpig Caricature. Thank you to Kris and Claire from Bump Studios and Balboa Graphics for making me feel that nothing was too much trouble and for going that extra mile as always. Personal note from John to end. After working with Graham for over 25 years with Groundpig, my one regret is we never recorded and produced a professional product i.e CD. 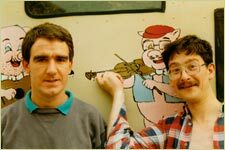 I feel it has left a big gap in what Groundpig were capable of, Graham had written some great songs and together we had some great ideas. Regarding our achievement I think Groundpig left its mark not so much on the Liverpool music scene but more on the Liverpool pub scene at that time. Groundpig were a band whose popularity exploded simply through word of mouth. I feel very proud to have been a part of it.